Grab your free copy at Subscribed! Why Is PTC’s Stock Up 85 Percent This Year? Net Retention: How Has the Game Changed? Dragos Maciuca, Technical Director, Ford Research and Innovation Center. How do you Price a Connected Device? Do you Believe in your Own Product? 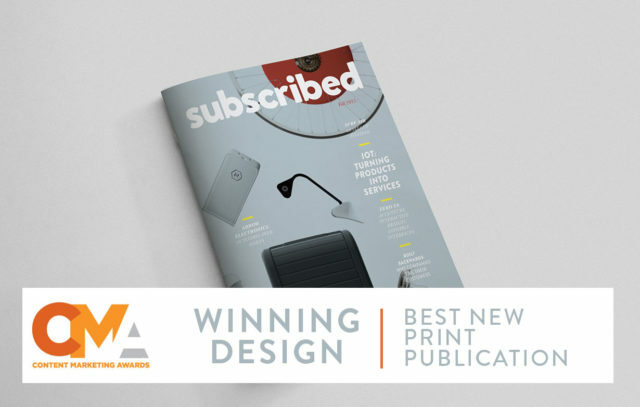 The inaugural issue of Subscribed Magazine won the Best New Print Publication award in the Design category at the 2016 Content Marketing Awards. It was also a Finalist in the Editorial category. Presented by the Content Marketing Institute, the awards are the largest content marketing awards program in the world. A panel of all-star judges chose the “best of the best” in content marketing excellence from more than 1,300 entries. Read more here. Where is the Value Potential of IoT?